Marriages are made in heaven but they are made romantic and royal in Rajasthan. Marriage is perhaps the most important and serious affair of one's life and everybody wants to celebrate this auspicious occasion in a special way so that the day becomes the most memorable day of their life. 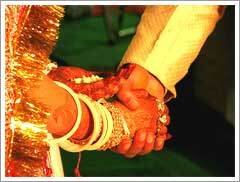 Rajasthanis have long perfected the art of celebrating a marriage in a very admirable manner. Many couples from different states and countries come here for getting married and choose stunning palaces or havelis as the venue for the auspicious ceremony. In recent years most of the known newspapers and TV channels have featured several cases of visitors from India and abroad flocking to Rajasthan to tie the knot. In Rajasthan marriage is an affair that is celebrated with great pomp and show. The state is soaked in its beautiful rituals and traditions. The people here love to celebrate even the smallest affair in a grand way. They are simply in love with celebrations. On the wedding day the venue is decorated with lights, flowers and other decorative accessories. The date of marriage in Rajasthan is planned according to the planetary considerations. The auspicious dates for wedding usually fall in the months of May- July and November -February. If you are planning to tour Rajasthan in any of these months and get a chance to attend a wedding, remember not to miss the opportunity. The auspicious ceremony takes place at the bride's house where the bridegroom comes with his relatives and friends. The procession is called Barat and the accompanying people are called Baratis. The bridegroom comes on a white mare to take his bride with him. He is attired in sherwani and a colorful turban with a sword tucked away on one side of his waist. The bride wears a brightly colored lengha, usually red in color as this color is considered highly auspicious in Hindu culture, coupled with stunning heavy jewelery. She applies mehandi on her hands and feet on the night before the marriage which heightens her beauty. She simply looks awesome. She remains under the veil till the last ritualis performed by the relatives. Moksha - liberation from earthly desires. Then the bridegroom applies sindoor(red colored powder)on bride's forehead and adorn her neck with mangalsutra( a necklace)while the pandit read mantras. After this ritual both of them take blessings of the elders. Now its time to gorge on the grand feast. After marriage the bride comes to the bridegroom's home. At his home Ghoomar dance performance is organized and according to the Rajasthani ritual the bride is also expected to dance. And now starts the new phase of the couple. Attend a traditional wedding of Rajasthan to savor a lifetime experience!